Photos from the Stations of the Cross on April 5, the Friday before Passion Sunday 2019. Saturday, January 5, 2019, on the “Vigil of Epiphany”, Canon Ueda blessed Epiphany Water after a low Mass for First Saturday. The faithful brought in many bottles of water to be blessed for their use at home. This gallery has a few photos from that ritual and a link to a larger gallery. Photos from the High Mass at Immaculate Heart of Mary Oratory San José on Passion Sunday 2019, with processional statues of Christ's Passion from our host Five Wounds Portuguese National Church. 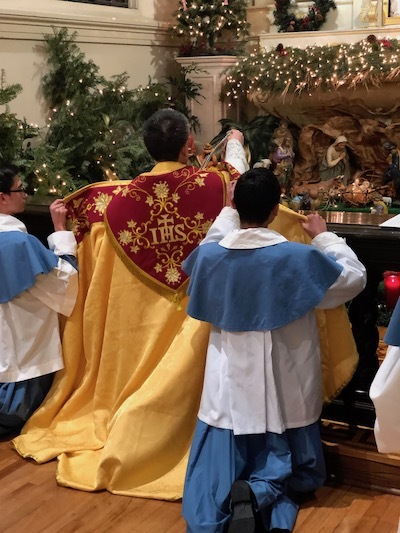 This gallery is from the first Mass of Christmas, Midnight Mass, at Immaculate Heart of Mary Oratory in San José, at Five Wounds Portuguese National Church. This gallery has photos from the visit of San José's Coadjutor Bishop Oscar Cantú to the Immaculate Heart of Mary Oratory on March 2, 2019.